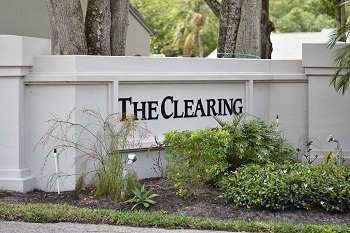 The Clearing is an attractive community of two and three bedroom, one story villas with carports located in the northeast section of Palm Harbor, Florida just off East Lake Road. The charming grounds of this neighborhood help to make The Clearing prime real estate for home buyers. The homes for sale in The Clearing offer spacious rooms, volume ceilings, walk-in closets, and delightful views of cypress trees, private preserves, and gardens galore. Built between 1985 and 1988, these villas are affordably priced, with reasonable monthly maintenance and homeowner association fees. The Clearing villas are sized to accommodate your needs averaging between 1100 and 2000 square feet of living space. Enjoy the community pool, fitness center, golf course, park, and tennis courts right in your own community. Close by are restaurants galore and plenty of shopping. Picnic at John Chesnut Park, golf at Lansbrook, bike along the Pinellas Trail, and enjoy the sandy beaches of the Gulf of Mexico all within either minutes by car or bike. You can even walk to some of these places from The Clearing. It is very centrally located in East Lake. Selling your Villa in The Clearing? Trying to sell your Villa? Call us today! We will work with you in finding the best possible sale of your home- in no time! DON'T wait another day. Contact us today and see what's in store for you or simply enter your contact information in the form below to get started! We look forward to hearing from you.